Last week I went from needing to burn an excess of over 200,000 calories to under 200,000 to reach my goal weight. I sit at 194 thousand and change as of now. This week I dropped below 200 pounds, hitting 198.0 this morning means I have a shot at not going back over on a morning weigh in…. ever again, or maybe that never again part will need to be reserved until the end of next week. Once I hit the 196 range even a big salty meal at night wont push me over for the morning weigh in. Officially my BMI today is 30.11, when I get to 197.2 pounds my BMI will be under 30. So I am on the verge of…… drum roll please…….. about to lose 0.8 more pounds. Which means officially I will be moving from the obese category to the overweight category. Looking ahead the only other milestones of this nature that I will hit is getting to where I need to burn less than 100,000 calories. Technically I could then count down by 10,000’s too, which might make the last push easier. I have some other milestones that I have set as well. They are about performance. I want to swim a 10 minute 500 meters. I am moving in on this goal. During my swim class last night I swam 10x100s on the 2:20’s. My first few were at 1:50 but this number drifted up to about 2:00 by the last one. Once I get into a groove and swim at a pace I can hold for a few hundred I hit about 2:00 for each 100. To get to my goal I need to go 550 yards in 10:00, which is 1:49 pace per 100 yards. Another thing I have going for me is that when I reach the goal I will be going all out for 550, which is much less then a normal workout. Since I will not be pacing myself to complete more, I can completely wear myself out by the end. I would expect that within a month I can do this. I will make my first attempt during my workout tomorrow morning. The main problem is that I have to swim after my running because of the pool schedule and the kid’s swimming classes, so I will not likely be breaking personal records after I wear myself out running. Once I can though it is a sure thing when I do the swim first thing like in a triathlon. OK so two days and it really six weeks, but I felt like sharing now. 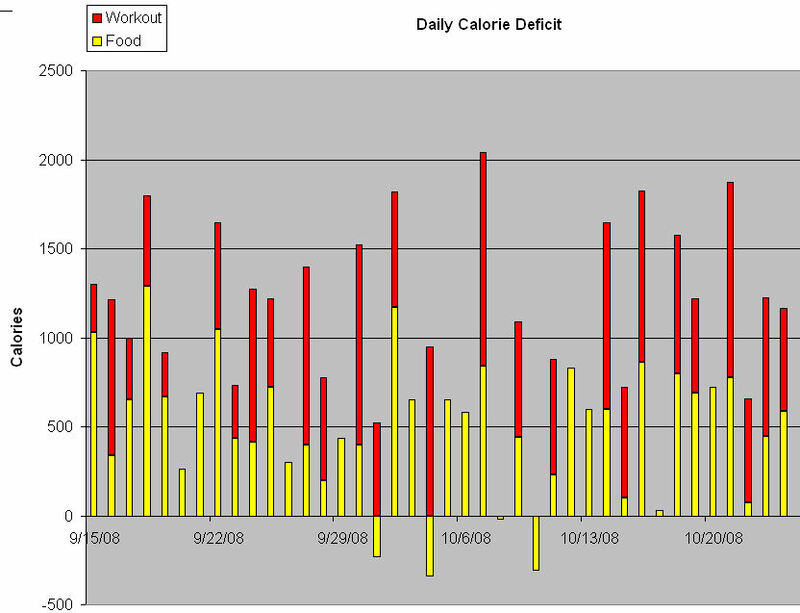 So Here is a chart that shows my daily calories deficit in both food and workouts. The food is based on my need to eat about 2600 to maintain my weight without considering the workouts, from left to right this number changed from 2610 to 2585 because of the weight loss. So the days you see the food dip below the zero line, this means I ate that much more than 2600 calories. Two of the four days were during workout days and I was just ravenously hungry, the workouts put me back up. There were only two days where I wound up negative. If anyone is going to try this method of tracking to lose weight loss, then I have a few things I have found to share with you. Notice the height of the red bars on the first week. They are short. These were days when my goal was just to do some workouts. I was swimming 600 to 1000 yards and was totally beat from the effort. I was doing the workouts, and logging the 40 minutes or so per swim bike or run, but I was not able to keep them going non-stop all out, it wasn’t really a run it was a jog/walk/jog/walk. None the less the calories were being burned and I was getting more fit. I was able to keep the eating down, and this first week was the best week on that front. This is a good way to start the program, and it would be best to do this, even starting out much lower. Remember I had been going at my triathlon training for about 12 weeks using the south beach diet before this chart started. So I worked up to this point of fitness by getting ready and competing in a sprint triathlon (500 meter swim, 11.7 mile bike, 3.7 mile run). If I had it to do again, I would not train on a low carb diet. There were days I felt like I had put in 110% and was going at 80% of my best speed. The body just needs more food when you workout more. So as we start to see week two red bars getting bigger we also see the yellow ones getting smaller. This might seem like an accident or a failure to control my willpower at the table, but it is fuel for working out. It is hard to do these long (45-60 minute) high effort workouts 6 times a week, with a nice 85 minute workout on Saturday with a swim back-to-back with a treadmill. The body needs food to do this and then do it again the next day. The way I am able to do it is by eating 6 times a day. I have the regular 3 meals and three snacks after each meal. After 6 weeks I am finding that what works best to control my appetite is to eat about 400-500 calories for breakfast, 120-150 for a morning snack, 500 or so for lunch, with another 120-150 snack in the afternoon, then a dinner of 500, with a nighttime snack of 200-300 calories. Now this is just the average, I get cravings due to a varying workout schedule and just go for it. At first I felt guilty, but then I noticed if I ate 1000 calories for lunch after a run, I would tend not to want the afternoon snack or if I did then the dinner might be light. If you are working for a goal that is below what you need to maintain weight, and over each week are averaging below it then you will be better off to listen to those cravings as long as they are simply to eat. If you don’t take care of them you will suffer from lower energy levels and or a more costly binge later. I think the willpower should not be used to stop from eating, it should be used to stop from eating the crap and instead eat something healthy. If my appetite is not huge and I am getting a meal ready, then I have some leeway to pick something based only on calories total. I can eat the foods that are more taboo because I am currently in control and will not keep going. I am not all that hungry and get 500 calories, maybe I eat a corn dog (microwaved=280 cals) and a french onion soup (costco style=210 cals) then a cup of lettuce with a few spritzes of that 1 calorie per spray salad dressing and a quart of water. However, if I am feeling like I can eat a horse, then I must eat healthy because I will be back for more if I don’t stuff my gut. I get 2 cups of lettuce, 1/2 c cucumbers, 1/2 c carrots, and 2 T of good salad dressing for about 150 calories total, then I add a whole wheat pita for 180 calories that is stuffed with 100 calories of lean ham and some cooked veggies with salsa and possibly some shredded no-fat plastic, I mean cheese. If that won’t quite do it then a cup of steamed brocolli will. It is difficult for me to stuff down the food sometimes, but if I am still hungry I will eat more, that is where the willpower helps. Eat that brocolli! The thrid week I learned a lesson. You can see the yellow bars dipping below 0, I ate 2900 calories or so on Wednesday. I swam on Tuesday morning (600 calories), ran for lunch (525 calories) and then rode my bike Wednesday (520 calories). I ate a big unhealthy dinner of 1500 calories. Red Robin Burger and Fries and a couple of pulls off the kid’s milkshake’s. Ouch. The thing was I had not conserved calories earlier during the day, cause I was so hungry from the efforts of the past 36 hours. That one meal canceled out all but 150 calories of my three workous. It was not worth it. That is one point of data that verifies my rule, only eat healthy if you are starved. If you eat out, kid’s birthday dinner or not, better choices are needed if the calories are not in the bank from the rest of the day. The same lesson is evidenced on Saturday, the birthday party. We had papa murphy’s take ‘n bake pizza. We got the de-light ones which are thin crust. They are large pizza’s with only 165 calories per slice if you hack it into 10 pieces. Well we did 8, so it was 205. The thin crust is easy to eat. I tried to control myself at dinner and managed to stop at 1180 calories which included a salad, water and the pizza. Then later that evening, still not satisfied, I got more and had another 765 calories. I swam and ran for a total of 950 calories earlier that day which is why I was so hungry. I also was holding back some earlier knowing we would be eating pizza that night. That made the craving too strong. It’s not only birthday parties that mess me up, the wednesday of week 4, after a swim on tuesday (580 cals) and a run at lunch (620), I started grazing Wednesday late afternoon till dinner to the tune of 1100 calories and still had 300 more for dinner. Again, the non-filling not-so-good crap needs to be left for when I am not famished. Tuesdays workouts got wiped out in much less time: bowl of cereal – glass of juice – handful of peanuts – small peanut butter sandwich – glass of milk; one right after the other. All just a warm up for dinner. Now I will be the first to admit this tracking crap is a pain. I will also admit that as I am just putting it all down in a spreadsheet and carrying a notebook around for adding up when I am not near my computer on the weekends it is really getting to be much faster. I spend a total of 5 minutes a day tracking it now so there is really no good reason not to do it. Once you get the spreadsheet set up and ready to punch in the numbers it only takes minutes a day. If anyone wants the same spreadsheet I am using, just ask for it in the comments and I will email it to you blank and ready to go. The email address is hidden from anyone but me so no harm there. The whole point I guess is that if I had not tracked all this so close I would not have a clue the mistakes I was making that wiped out the entire week of exercising. Now I would still have lost weight to this point, as I did lose 12 pounds so far (201.6 woohoo), but I would not have had the data to see my mistakes and they would slow my progress down going forward. There is no way to make improvements if you don’t measure what it is you want to improve. Not with any certainty anyway. If you ask a skinny person if they have ever binged, they will say yes. If you ask that skinny person if they have ever done so for a few days in a row they will say yes. So far we can cross of the word skinny. But, if you ask a skinny person if they knew what they needed to do to lose those couple of pounds they might have gained, they will say yes. They can listen to their body and know what is going on, build that calorie deficit and get back to their normal weight setpoint, just the same as a person that understands their budget and finances can save up to purchase a new TV, or even buy it on credit and get it paid off quickly. Now I would not be able to answer yes, or if I did it would be simply becuase I knew I could exert my will for a few days, knowing full well it would blow up after a while. Now that I am tracking all this stuff, I can say yes. I know exactly what I need to do. I have measured and looked at my mistakes and because I have everything for the last 6 weeks sitting there to review, I am able to learn what works and how my body handles food and exercise. One day I may be able to do it all by feel, but what harm is there in taking an extra 5-minutes for tracking and maybe an hour or two reflecting once a month on the lessons I need to learn. It will make the next six weeks that much more potent, and I will reach my goals faster. For those that are curious, my weight drop on the chart above was from 213.6 to 201.6, I ate 19450 calories less than I needed to maintain my weight with no exercise, and worked out to the tune of 18240 calories. The total is 37690, which at 3500 calories per pound would be 10.8 pounds lost versus the actual loss of 12.0. The extra 1.2 pounds is probably from eating more just before the diet started. If I take out the first week and use the average weight of the last 5 days of the first week once that extra 2 pounds went missing, the numbers I calculated versus the weight I measured match exactly. There is a variance from day to day of as many as 2 pounds above or below the calculated number, but most of the time my actual weight is within 1 pound of the estimated weight.